Food Blogga: A Recipe for Jalapeno Cheddar Cornbread. 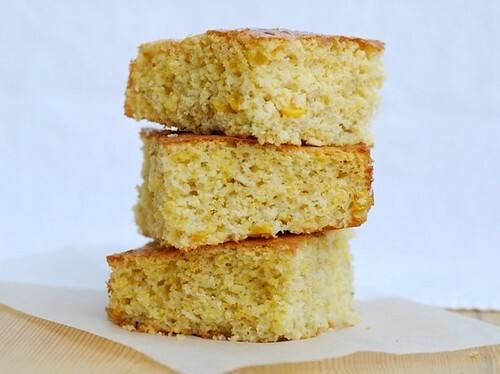 What's Your Favorite Cornbread Recipe? A Recipe for Jalapeno Cheddar Cornbread. What's Your Favorite Cornbread Recipe? I love Austin, Texas. The people are warm, the food is amazing, and the weather -- well, let's not talk about the weather. Let's stick with the people and the food. One morning while Jeff and I were eating breakfast at an Austin eatery, we started chatting with a lovely elderly couple next to us. The conversation quickly turned to food: we talked brisket, chili, Shiner bock (which they drink from the bottle), and cornbread. When I told the wife that I had never made corn bread in a skillet, she replied, in a dramatic affected Southern accent, "Well, dahlin', if it ain't made in a cast-iron skillet, then it ain't cornbread." She shared how her skillet had been in her family for three generations and how she wouldn't dream of making cornbread in a regular metal pan or glass baking dish. I would have loved to share a sentimental tale about my family's cast-iron skillet and corn bread recipe, but the truth is, we don't have one. Sure, my mom made cornbread, but it usually came from a Jiffy box, and I wasn't gonna tell that to the Texan with the third generation cast-iron skillet. Although cornbread is a Southern staple, it comes in numerous regional variations across the country. Some of the most memorable ones I've had include a New Mexican cornbread studded with fiery hatch chilies, a New Orleans cornbread laced with Cajun spices and Cheddar cheese, and a North Carolina cornbread made with buttermilk and bacon. My favorite, however, remains the one I ate when I was a kid in New England: dense, sweet cornbread toasted with butter and drizzled with honey. 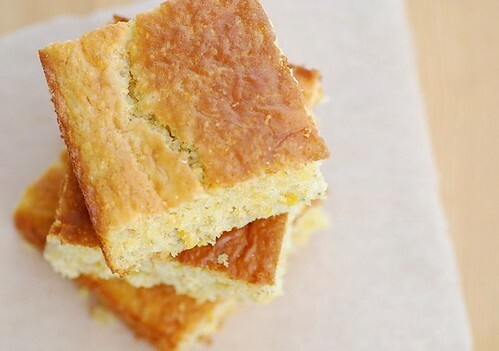 There aren't too many people who don't love cornbread. It's easy, versatile, and satisfying. It's delicious on its own, dunked in a bowl of hot chili, or used as a mop for excess bbq sauce on your plate. It can be simple and plain or chock full of add-ins such as bacon, corn kernels, and peppers. There's a corn bread to suit just about any taste. Since chilly weather is upon us, it's time for a substantial cornbread that pairs well with hearty chilis and stews, like my jalapeno cheddar cornbread. It's punctuated with crisp corn kernels, hot jalapenos, and creamy sharp Cheddar cheese. It was made in a 9 X 9 inch square baking dish, not a cast-iron skillet. Sure, I could go buy one, but to me, that's one of those things that should be passed down in a family. And since my grandmother and mother cared a lot more about making gravy and meatballs than cornbread, skillets didn't feature prominently in our house. So, tell me, what's your favorite cornbread recipe? 1. Place rack in center of oven, and preheat to 425 degrees F. Coat a 9 X 9 inch square baking pan with cooking spray. 2. In a large bowl stir together flour, cornmeal, sugar, baking powder, and salt. Add eggs, milk, and oil. Beat with an electric mixer until just smooth, about 1 minute. Stir in jalapeno, corn, Cheddar, and cilantro. 3. Pour batter into the prepared pan. Bake for 20-25 minutes, or until the top is golden and a toothpick inserted into the center comes out clean. My favorite cornbread recipe is just a basic cornbread-- nothing fancy in it. It's so easy and so yummy. It's a Marie Calendar's copycat recipe. Mix them both up according to directions, then combine the batters. This makes a huge amount, and I actually made up a dry mix to use; one batch of my dry mix makes a normal amount. You bake at 350 for 20 minutes. If you're doing the full amount above (4 times my dry mix batch), you'll probably need to bake it longer. Cornbread in a cast-iron: a classic Southern response. I've had a lot of different flavors but my favorite so far has been the bacon-chipotle cornbread by my friend's mom (who also makes it in a cast-iron). The sweetness of the corn kernals with the spicy chipotle and savory bacon is a great combination. What isn't better with bacon anyways? This sounds like wonderful cornbread, iron skillet or not!I prefer a sweet cornbread, so I'll be trying yours! I am so envious of people who have had cast iron skillets passed down from generation to generation. Some of them have been so lovingly taken care of, the cooking surface is like glass - so smooth, and amazingly non-stick. Unfortunately, my parents didn't have any cast iron cookware to pass down to us. So we have to start with our own skillet. We've already made things like whole wheat tortillas and blackened halibut in it. Hopefully one day we'll be able to pass it down to our kids. My favorite recipe that I use often involved melting 1/2 stick of butter in the pan before pouring the batter on top. It produces the most excellent flavor. I too love it plain with honey. At Claim Jumper, they take their leftover cornbread, dice it and make croutons out of it. It is such a great addition to their salad. I bought a cast iron skillet in hopes of making it an heirloom item. Hopefully my son's children will enjoy it. My favorite cornbread, a honey buttermilk version, isn't my favorite because it's the best one I've ever made, but for sentimental reasons, because it was one of the first recipes I made well when I was learning how to cook in college. Having said that though, it's a good recipe, and lends itself to all sorts of variations (http://tiny.cc/Q3mbN). A friend of mine lives in Austin... I love cornbread and yours looks wonderful! Those look AMAZING! The cheddar does it for me. but yours sounds pretty good too! I love making my cornbread in my (yes, pretty well used) cast iron skillet, with some mild green chiles mixed in. I'm all about cornbread when cool weather comes around. I always use corn kernels too, usually processing them with the liquid before adding them. I like less sweet and more crunch, so I always try to fine coarse cornmeal, and use a higher proportion of that to the flour. Recently I had some leftover cornbread that I sliced about a half inch thick and baked in a 325 oven until the pieces were crispy and browned. We topped them with a slice of vermont cheddar cheese and ate them with pork and green chili stew. They were divine! My favorite cornbread is actually sitting right now in draft mode, soon-to-be-blogged. I make a healthy, fat free but incredibly moist cornbread that goes great with my favorite chili recipes. I have a favorite cornbread recipe that is seasoned with cardamom. When I was a kid, we were in Tennessee and got some stone ground corn meal in the Smokies - I do like to revisit the recipe that came with that from time to time. It was an Appalachian classic. This recipe is very similar to mine. I love the idea of adding fresh cilantro. Thanks. My favorite is the one in Paul Prudhomme's "Louisiana Kitchen" cookbook. It tastes like Jiffy (which I love) but is substantial enough to hold up to gravy and pot liquor without melting away completely. And if you like, I'm sure you could add corn kernels, cheese, jalapeno, chipotles, a bit of adobo sauce, whatever. My father was from New England, so we grew up on sweet cornbread. If there was any left over, he would eat it the next day in a bowl with milk or cream poured over it. My favorite cornbread is sweet and made with bacon and corn. i live in austin but i grew up in northeast texas. the corn bread that my great grandmother made, proper cornbread, is not sweet and it doesn't come in "flavors". white corn bread that looks like cake is from up north, the stuff down here is denser because it's made from yellow cornmeal and it's unadulterated by other things like cheese or peppers. i'm not saying that's the only or even the best way to make cornbread though. traditional texas food is extremely bland unless it's texmex. my great grandfather (he's 94) thinks that spagetti sauce is "spicy" because it has spices like basil in it. i think he first tasted salsa in his 80s. janelle-Thanks for sharing! That is super easy and yummy. sean-Bacon and chipotle. I am so making that! lynda-I like sweeter cornbread too. nateandannie-You're so welcome! I agree. Simple objects can become family treasures. rookiecookie- Mmm... I have heard about cornbread croutons but haven't made them yet. That's going to change soon! kristin-I know exactly what you mean. Sentimentality is delicious. rosa-Thanks! I'll be checking it out! lydia-You gotta love those well-seasoned skillets. kate- I'm coming over your house the next time you make that cause it sounds to amazing to miss! tw-Cardamom? Now, that's one I have never tried but would love to. teachercooks-It adds just the right amount of freshness. anonymous-Oh, that sounds great! I love dense, "substantial" cornbreads. mimi-We never had it with cream, but sometimes my mom would mash a ripe banana on it and drizzle it with honey for breakfast. I'll have to try your dad's version sometime. I am not southern, far from it, but I only consider baking cornbread in my cast iron skillet. With bacon fat. Sometimes I will add green chiles, but mostly I am a purest. I love lots of butter and honey on warm cornbread. That is actually enough of a dinner for me. Making chili is an excuse to make cornbread! Besides a cast iron skillet, the most important ingredients are stone ground corn meal and buttermilk. Nothing compares to this southern bread. Cornbread and vegetable soup...yum, yum! I am seriously in love with the Vegan Soul Food Jazz Cornbread in Crescent Dragonwagon's The Cornbread Gospels. It contains a can of creamed corn which gives it the most delectable texture. The whole book is pretty cool with cornbreads divided by region of the country. I'm ashamed to say I've never eaten cornbread, but then again, it's not really something you see much over here. Sounds yummy, though, so I suppose I should really make some of my own! Your recipe is similar to mine Susan, although I don't make it often not growing up in the South. Susan, Love your blog. Your cornbread looks delish. As a fellow Italian gal with no cast iron skillets in the family, I too have made cornbread in glass dishes. But lo and behold I received a shiny new le Creuset cast iron skillet for Christmas two years ago. My cornbread is SO much better in it. Thanks for featuring my cornbread recipe. I hope you get to try it and will like it as much as I did. Nope, no 3rd generation cornbread skillet in my family either... I feel such a failure! ;-) My excuse is that I'm not even American, let alone from the South... This look utterly amazing! Nothing better than a chunk of cornbread dunked in chili. Comfort food at its best! p.s. - 'scuse the ignorance but what's wrong with the weather in Austin?? I love the Cook's Illustrated cornbread recipe, which I add jalapeno and cheddar to. I'm surprisingly not a huge cornbread fan, or I wasn't till I tried that version. I *love* the blueberry cornbread recipe my friend Stephen sent along a few weeks ago! My mom used Gladiola (owned by Martha White, I believe) and she always made it in the skillet. She'd melt the butter first then pour the cornbread batter into the hot skillet with the melted butter. Also, she never made sweet cornbread, but my parents always dipped it in Cane Syrup so in the end, it was kind of sweet. Mix peppers and bacon. Set aside. Put butter in 8 inch cast iron skillet and set skillet in cold oven and turn heat to 350. While oven is preheating and butter is melting (keep an eye on it or it so it doesn't get too hot and smoke), mix dry ingredients in a mixing bowl. In a second bowl, mix buttermilk and eggs. Gently add buttermilk mixture to dry ingredients. Stir only until moist. Batter should stay lumpy. Stir in bacon/chipotle mixture. Remove hot skillet of melted butter from oven. Pour cornbread batter into hot butter. Bake for 20-25 minutes or until it is golden brown. I'm a Southern girl and I love cornbread. But I don't care for sweet cornbread. I like yours with the Japapeno & Cheddar. Some Southerners take left-over cornbread, crumble it in a glass, and pour buttermilk over it. Some people (obviously not Southerners) call it a Hillbilly Smoothie. Have a great weekend. Thanks for stopping by my kitchen. I enjoyed reading your blog. So many good things here. A couple of years ago, I made a batch of cornbread, using my Mother's old recipe. I could hardly eat it, since it contained so much fat. Yet I'd eaten piece after piece when I was a kid, and loved it then. Tastes change. I'm so glad you love Austin! I didn't grow up here, but I've become pretty fond of it over the last 17 years. Your cornbread sounds like a great one. Sometimes, I like it simple with just black pepper added to the plain batter, and sometimes I like just like yours with jalapeno, cheese, and corn. Here's what I love to do with leftover cornbread: Slice it and fry it in butter, till it's brown and crispy, then annoint/drown in maple syrup. Oh my..... so fine! mmmyum, looks tasty, very different. gudrun-Yes, I've heard bacon fat adds incredible flavor, but I didn't have any bacon in the house. lesley-Buttermilk renders it really moist. I love it with soup too! nanette-That is so cool! I'll have to check it out. Thanks! mary-I'm happy to hear that! Please let me know how it turns out! susan-Le Creuset! That's what I need! :) Thanks for your kind words. olga-My pleasure! I'm sure gonna try! jeanne-The weather is hotter than hell! tara- I made a blueberry cornbread with basil last summer and loved it. johanna-My mom loves creamed corn too. I'm thinking of try a pumpkin one this season. Sounds amazing! mycarolinakitchen-A Hillbilly Smoothie? That is too funny! Glad to meet you too. anonymous-Isn't that funny how your tastes change like that? Thanks for sharing your low-fat version! lisa-I didn't realize you were in Austin. Oh, yes, I love it there! Maybe we can get together next time I'm there. annalise-I'm in love with that idea. Seriously! Sometimes I like my cornbread savory, especially with jalapenos and cheddar like your recipe. Other times, like at breakfast, I like it sweet. The best recipe for sweet cornbread that I know of is my granny's: To any cornbread recipe, add a little vanilla and then pour cream over the top of the batter before you put it into the oven. The cream soaks in when its baked. adore your recipe. stumbled upon your blog from www.food52.com, lovely blog. who exactly are these people who dont love cornbread? i had a lovely cornbread at a restaurant called Masa in Boston- they served it with apricot chipotle confit. shall try your recipe. I so need to quit the Jiffy mix and make some *real* Corny bread. This looks like a great recipe! Here's another recipe I recently did and really liked. It's particularly nice because you bake it right in a cast iron skillet. Try it out and let me know what you think! erina-I can't. Don't have a skillet to bake one in!